Most couples think their pro photos are done after the cake cutting — but these incredible pictures will make you want to sneak outside for one last photo before the night ends. 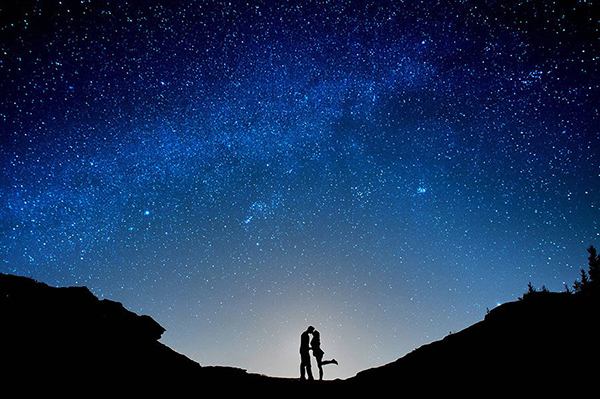 Take advantage of a scenic overlook for an ethereal photo under the stars. Head to the middle of a quiet street for a beautifully framed photo. Grab a pair of candles for some romantic mood lighting. A walkway lined with luminaries is the perfect spot for a photo under the stars. Head outsite right before the sun disappears beneath the horizon for an amazing silhouette shot. Add a dreamy feel to your photo by tossing your veil in the air. Getting married at a planetarium? Take advantage of the décor for an out-of-this-world photo. Or take a photo under the actual moon! A cloudy blue sky without a star in sight provides a wonderfully simple backdrop. Steal a kiss beneath the trees. A backlight perfectly illuminates the bride and groom. Take advantage of the season's changing leaves for a gorgeous nighttime photo. This incredible wedding photo is straight out of a fairy tale. Take advantage of a rainy wedding day for a stunning photo. Street lights illuminate the couple in such a romantic way. A gazebo draped with twinkling lights is the perfect backdrop. A rainy night gives you the perfect opportunity to capture some silly photos. The rain looks even more romantic in black and white. Light up the night for a magical wedding photo. A white umbrella really pops against the night sky. A cloudy night sky looks absolutely ethereal reflected against a pool. Petals tossed into the air catch the light in a fun way. Getting married near the holidays? Take advantage of your town's holiday décor. Celebrate with your squad one last time before the night ends. Have fun with sparklers! There are so many creative ways to use sparklers in your photos. End the night with a bang — literally. Light up the night sky with paper lanterns for a moment you'll never forget. Give your wedding photos a fairy tale feel by adding a smoke machine behind a gorgeous natural backdrop. Sneak away together to reflect on the wedding day — and share one last kiss.